Tasting Notes: A cornucopia of earthly delights, including passion fruit, guava, apple, fresh fennel and coconut oak spice. Grapefruit, pineapple and herbal tea notes join the choir on the palate, and OH! there’s a little hint of lemon meringue pie for dessert. The acidity gives the impression of a coiled spring, implying that this baby will improve with a few years’ ageing. With great patience, comes reward after all. Food Pairings: All that tropical fruit, lip-smacking acidity and hints of herbal are just screaming to the forefront of your palate. Why not create a simple fennel salad with some sweet Mandarin oranges, a squeeze of lemon, a chiffonade of chopped mint and a splash of your fav EVOO. Add a little grilled chicken or some grilled tofu and you’ve got yourself a great meal. Winemaker's Production Notes: The most interesting Sauvignon Blanc we harvest comes from our own estate vineyard; the Backyard Block. First pick is always reserved for our zippy Backyard Bubbly. Second pick; for our complex, 100% stainless Backyard Block. Coming in last only in position is the Reserve bottling. Always the ‘ripest’ and most complex, this fruit goes to barrel for fermentation. The 2016 vintage was stinkin’ hot, so we rushed to get this last pick in, just before our beautiful tropical flavours went out with the baby and the bathwater. Appearance: Clear, pale intensity, lemon with slight green hue. Nose: Medium-plus intensity. Lemon, grass, butter, oak, fresh garden herbs, pineapple. Palate: This wine is dry, with medium acidity, medium-plus intense characters of pineapple, tangerine, lime, brioche, almonds, nutty oak characters, and stony minerality. Quality: This is very good quality wine that mirrors the style of well-made white Bordeaux. It expertly balances fresh citrus and tropical fruit characters with oak characters from barrel aging. There's also a nice creamy texture from extended lees aging. Drink now to enjoy the freshness, although it will gain more complexities if aged for another 2-3 years. Food pairings: Roasted cod, steamed shellfish in a white wine and pancetta broth, scallops cooked in butter, garden salad with goat cheese, roasted chicken with tarragon butter. 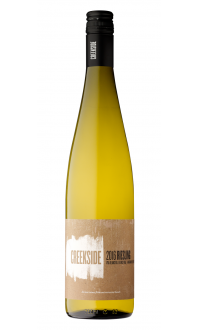 There isn't another winery in Niagara as revered for Sauvignon Blanc as Creekside Estate Winery. 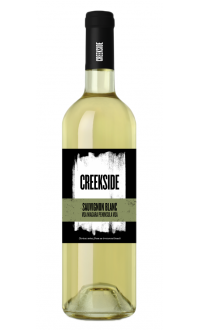 The signature Sauvignon Blanc is bright and fresh and one of the best values out there. 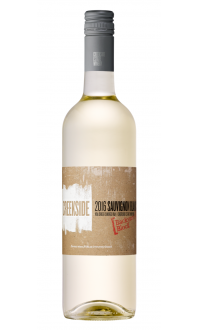 With the 2013 Reserve Sauvignon Blanc, the style is more in line with the oak-aged Sauvignon Blanc and Semillon blends from Bordeaux, or the Fumé Blancs from California. The 2013 vintage was one of fluctuation, although a warm September and October made for very good grape quality in most cases. The grapes were barrel fermented at a cool temperature and aged for 10 months on the lees in French oak barrels, 50% of which were new. This is a great wine for those who appreciate the creamy texture and buttery notes of an oak-aged white, but who also like a certain level of freshness in their glass. Save it for a summer afternoon and drink it alongside a meal out on the deck.